The author is an area assistant with the University of Arizona based in Cochise County. It’s important to know the minerals present in your forage when formulating a supplement program. We want to avoid over supplementing with minerals that are present in abundance. For example, many parts of the country deal with excess levels of selenium, which can quickly become toxic at relatively low levels. Other parts of the country have the opposite concern with significant selenium deficiencies; thus, supplementation with selenium is a necessity to prevent reproductive issues and white muscle disease. The mineral content present in forage is primarily based on the geology of the land, but it can be influenced by a number of factors, including the forage species and rainfall or irrigation. Moreover, the type of complex a mineral is present in can impact its bioavailability to the animal, as can antagonistic effects from other minerals present in the diet. Bioavailability, which is the difference between the amount consumed and the amount that is absorbed and reaches its target, and antagonistic effects are very difficult to measure scientifically. Additionally, the cow’s current production status (open, pregnant, or lactating) will influence her needs, and some cows will over or under consume a free choice supplement. Despite these challenges, understanding what minerals are severely lacking or are overabundant in a forage system should be the first step in developing a mineral program for an operation. Minerals fall into two main groups: macro and micro. This doesn’t necessarily mean “most” and “least” important; rather, macrominerals are required in much higher amounts than microminerals, which are sometimes referred to as trace minerals. A deficiency in a micromineral can have just as large of an impact as a deficiency in a macromineral. The National Research Council (NRC) has established requirements for six macrominerals important for cattle (calcium, phosphorous, sodium, chlorine, magnesium, and potassium) and 10 microminerals (iron, manganese, copper, zinc, selenium, cobalt, iodine, chromium, molybdenum, and nickel). Of these, phosphorous, copper, zinc, selenium, and magnesium are of significant importance to cow health and reproduction. The University of Missouri Cooperative Extension has an excellent article discussing the importance of each mineral and their function in the body, as well as information on how much of each mineral cattle in different stages of production require (bit.ly/HFG-minerals). If you are grazing pasture, sample your forage at several points during the year to develop an overall picture of your operation’s mineral curve. Be sure to hit at least the “highs and lows” of the peak growing season and the worst time of year (typically midwinter, if your cattle graze year-round). Some minerals remain fairly stable throughout the year, while others can fluctuate significantly with rainfall or stage of growth. 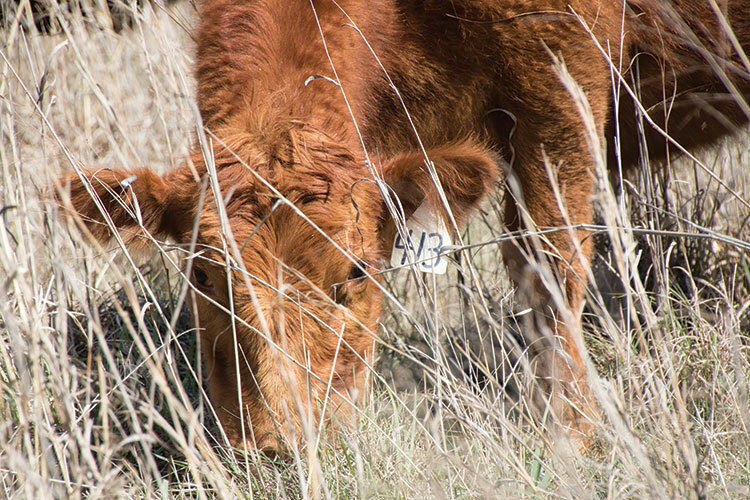 For example, grass tetany is caused by a deficiency in magnesium due to the higher water content of lush, growing forages and typically becomes an issue in early spring. In Arizona, research has indicated that copper levels can vary considerably from year to year correlated with rainfall and drought conditions, becoming more available in dry years and declining during wet ones. In addition to sampling throughout the year, be sure you have sampled all available forage or feedstuffs your cattle will be consuming. This includes supplemental hay or grain that cattle may receive at various times of year. Those grazing native pastures will want to sample the species their cattle most commonly utilize and leave out species that are not typically grazed. One sampling site we are currently conducting research on in Arizona includes a large number of browse species that cattle use heavily during certain times of the year. These species have significantly different mineral profiles than grass species and are consumed in different amounts. If your pasture has both, sample them separately and consider the proportion that each is typically utilized. Additionally, sample water sources as these minerals contribute to the overall picture of what is available to the cow herd and could contribute to a toxicity and/or antagonistic effects. Once you have an overall picture of the minerals present in your feedstuffs and water supply, begin to select a mineral product that fits your needs or have a custom mix formulated. It is especially important to consider if a mineral package meets livestock needs for supplying minerals that are low or may be significantly affected by the antagonistic effects from another mineral. Also look for mixes that don’t add additional levels of minerals you have in abundance. This helps to lower costs, and depending on the mineral can help to lessen the antagonistic effect it could be having. Several of the native pasture samples we have taken include extremely high (300 to 800 parts per million) iron levels. These levels are likely contributing to the existing copper deficiency, and including more iron in a mineral supplement for this pasture would be counterproductive. The effects of an antagonistic mineral can be overcome by boosting the level of the mineral it is affecting in the diet above what is needed, or by choosing an organic mineral product. These products, also called chelated or proteinated, have the mineral bound to an organic carrier molecule (such as an amino acid) to enhance their bioavailability. These types of minerals may also be less affected by antagonistic minerals; however, these products come at a higher cost than the typical inorganic mineral complex form. In conclusion, mineral supplementation is a careful balancing act. Commercial products have been formulated to maintain those balances. If you will be having a custom mix made, consult a professional to ensure you are maintaining important ratios, avoiding potential toxicity issues, and providing your herd with the mineral nutrition to be successful and productive.